Beautifully formed 3D acrylic rose brooch by 'Big Baby'. 4cm/40mm diameter. Pin with roll-over catch. Beautifully formed larger 3D acrylic rose brooch. Various colours available. 6.5cm/65mm diameter. Pin with roll-over catch. Really cute kitty cat brooch. Acrylic with Swarovski crystal eyes, nose and bow. Various colours available. Measures 3cm/30mm widest point. Pin with roll-over catch. Please note you can see reflections in the photos they are not fault marks. Just a few colours left! Pretty bow brooch. Acrylic. Various colours available. Measures 6cm/60mm widest part. Pin with roll-over catch. Pretty bird house brooch with little bird, hanging from a blossom strewn branch. Acrylic. Very detailed with Swarovski crystals. Various colours available. 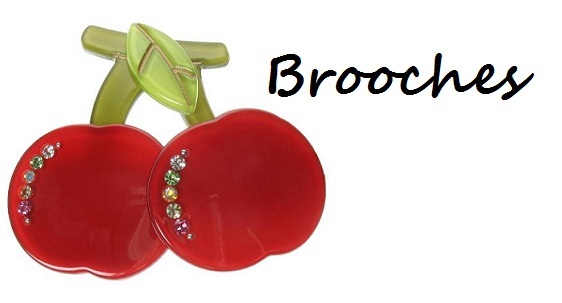 The brooch measures 6cm/60mm (length). Pin with roll-over catch. The photo of the black one is showing the studio lights - sorry about this - item is solid black. Pretty posey of roses brooch. Acrylic. Very detailed with 3-D roses. Various colours available. The brooch measures 8.5cm/85mm (length) x 5cm/50mm (widest point). Pin with roll-over catch. Pretty heart brooch with a posey of 3-D roses. Acrylic. Various colours available. The brooch measures 4cm/40mm (widest point). Pin with roll-over catch. The images show camera/lighting reflections they are not marks on the items. Cute sausage dog (Dachshund) brooch. Acrylic. Various colours available. The dog measures 8cm/80mm long. Pin with roll-over catch. Really cute fruit! 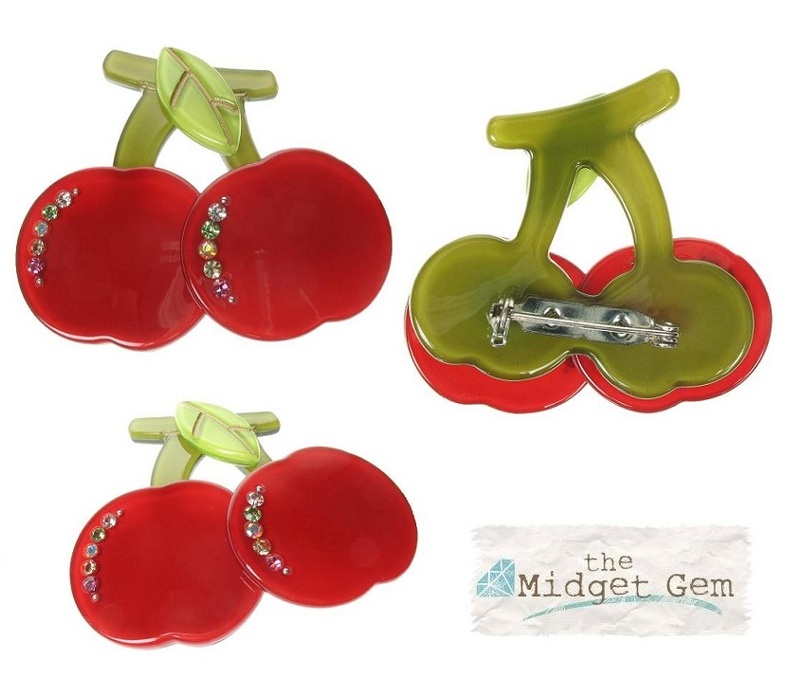 Fun pair of cherries brooch. Bright cherry red or black acrylic with Swarovski crystals. Measures 5cm/50mm (widest part). Pin with roll-over catch. 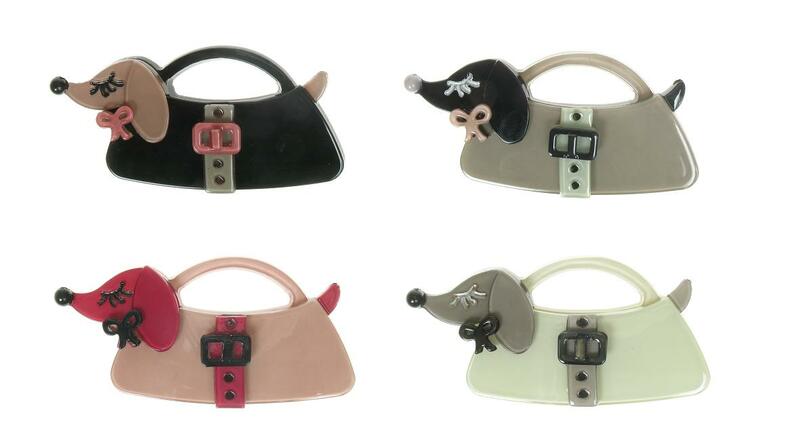 Cute sausage dog (Dachshund) in a handbag brooch. Acrylic. Various colours available. The dog measures 5.5cm/55mm long. Pin with roll-over catch. Light/camera reflections are shown in the photos, they are not fault marks.